Published on the 4th of December 2018, the General Scheme of the Companies (Corporate Enforcement Authority) Bill 2018 presents a number of suggested changes to the Companies Act 2014. Still, in the draft stage, the Bill will most likely look quite different when enforced, but there are several key elements that will impact the governance and operation of a limited company in Ireland. 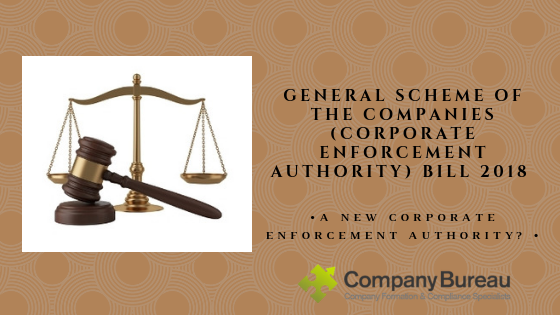 A New Corporate Enforcement Authority? The Bill suggests the implementation of a new Corporate Enforcement Authority to investigate suspected breaches in company law. This step is in response to the apparent failings of the current format – the Office of the Director of Corporate Enforcement (ODCE) currently housed within the structure of the Department of Business, Enterprise and Innovation. During the much-publicised trial of Sean Fitzpatrick, the former chair of Anglo-Irish Bank, the ODCE was found to have mishandled elements of the trial leading to Mr. Fitzpatrick being acquitted. As a response, Heather Humphries, the Minister of Business, Enterprise and Innovation has confirmed the proposed new Corporate Enforcement Authority will operate independently of any government department. Under the proposed legislation, the minister will appoint three people to the new authority to run and administer the entity. These three members will have greater entry and search powers than the ODCE did previously, to be more effective in investigating company law breaches. The Companies Act 2014 has been in force since June 2015, and the General Scheme of the Companies (Corporate Enforcement Authority) Bill 2018 seeks to address some functional issues with regards to share capital. The changes focus primarily on the use of or availability of reserves in a company. The alterations increase the uses for the share premium account when it comes to writing off expenses or when commission needs to be paid on any issue of shares and debentures. In addition, an Unlimited Company (UC) would no longer be required to have profits available for distribution in order to acquire its own shares. In order to increase the accuracy of information held by the Companies Registration Office (CRO), PPS numbers are to be provided when incorporating, updating or changing the directors of a company. The legislation does not provide for details to be listed on the public record, so they will remain off the public record. Directors not yet issued with a PPS number will instead, provide a copy of their passport for verification. This is likely to improve the approximate 22% level of inaccuracy on the register due to the use of variation in individuals’ names and addresses. The proposed Bill also seeks to bring in provisions for directors to be restricted when they have failed to convene or properly manage the appointment of a liquidator to their company. This element seeks to remedy lengthy legal proceedings that would previously be commonplace for lack of compliance with proper liquidation procedures. The above points cover just some of the key proposals being put forward as part of the General Scheme of the Companies (Corporate Enforcement Authority) Bill 2018 to revise the effectiveness of the Companies Act 2014 and implementing enhanced corporate governance in Ireland. Should you wish to find out more about how any of these provisions impact your business, please feel free to contact our Company Secretarial team on cosec@companybureau.ie or call the office on +353 (0) 1-6461625.